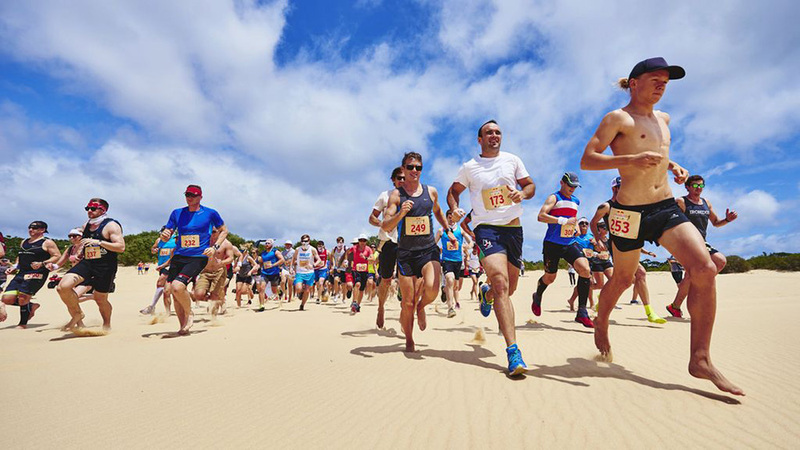 Running in sand is unlike anything else you have ever experienced. This activity is not just a peaceful, pleasing running experience, but it can also help you become stronger and faster runner. Running in dry, loose sand is more difficult than running on pavement, so you’ll definitely work harder and sweat more until you finish your daily routine. But, on the beach, after a tough workout session, you always have the option to run straight into the ocean, and go for a calming swim to relax your muscles. Sounds amazing, right? Are you a beginner? Before going on the beach, you should probably prepare yourself with several ankle exercises in order to avoid injury. You can simply add them in your usual workout plan to prepare your legs for the change in terrain. Some of the exercises that will warm you up for the real deal are ankle stretches with a medium resistance therapy band, full range of motion calf raises, short duration heel walks, single-leg squats (be careful!) or maybe deadlifts. After a few weeks, or when you feel ready, go ahead and hit the beach! Low tide is probably the best time to try running on the beach. Also, you should start running on wet, firm sand. It’s easier to move, and it’s the best way to make your feet adapt to the new terrain. After a few runs, you’ll start to feel like you can handle more, but don’t push yourself too much. Slowly add 2 or 3-minute intervals on dryer sand, with longer runs on the wet surface. Try to increase the intervals with every new run, until you finally make your full transition to deeper and dry sand. 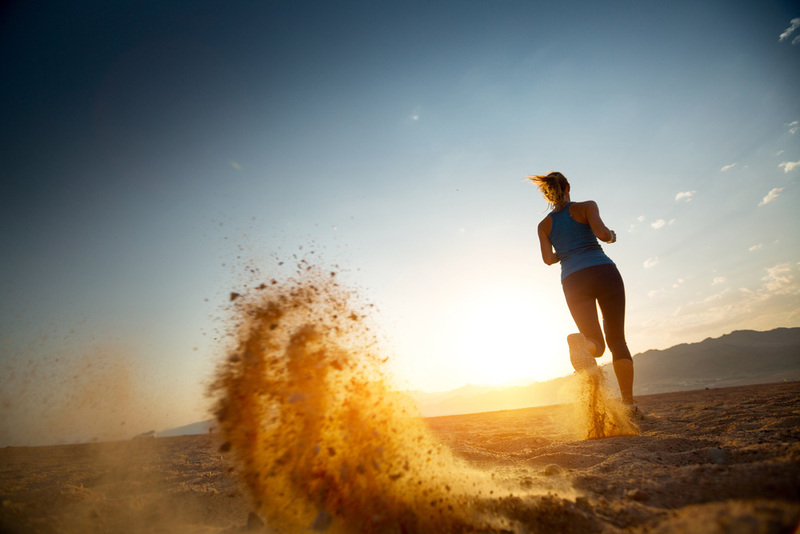 According to researchers, running on sand requires 1.6 times the energy it takes for running on a hard surface. Also, your body needs to work more. It’s almost like you are running with weights on your ankles. This is happening because it’s harder to get your foot up off the ground while trying to stabilize yourself in the sand. At the same time you’re also getting less forward momentum from your push-off, and less stability overall. So your entire body is working more, and yet you are running slower. All those tiny muscles in your feet and calves work overtime while running on sand, meaning you’ll get better results in fewer minutes. 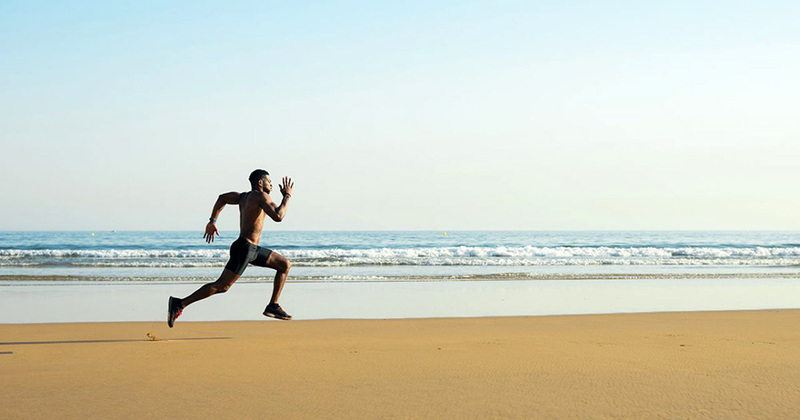 The most important question, however, is whether running on sand makes you faster? The answer is affirmative! You will run slower on the beach, because the sand is giving you resistance, but when you’ll go back to your usual terrain, you’ll move faster than ever! Less impact on your knees – when you are running on the beach, the sand is shifting beneath your foot, so you are landing on softer terrain, meaning your body is taking less stress. Strengthening your weak muscles – when running in sand, your body is firing up all of those inactive and small muscles that are ignored during regular exercise to stabilize you, making them stronger than ever. Building a stronger body – the effect here is similar… your body is getting a more intense workout, becoming more powerful than before. Burning calories – can you lose weight by running on sand? You won’t just burn more calories and lose weight, but you’ll do it in record time. Considering the intensity of the workout, you will burn extra fat both during and after the running session. Fresh air – the running on sand benefits make up for a very long list if you compare the activity against other cardio workouts within the gym. Filling your lungs with fresh, ocean air is only one of them! Even if you are a “lazy” cat like myself, and enjoy working out in the comfort of your own home, sand workouts are far superior if you are willing to step out of your comfort zone. 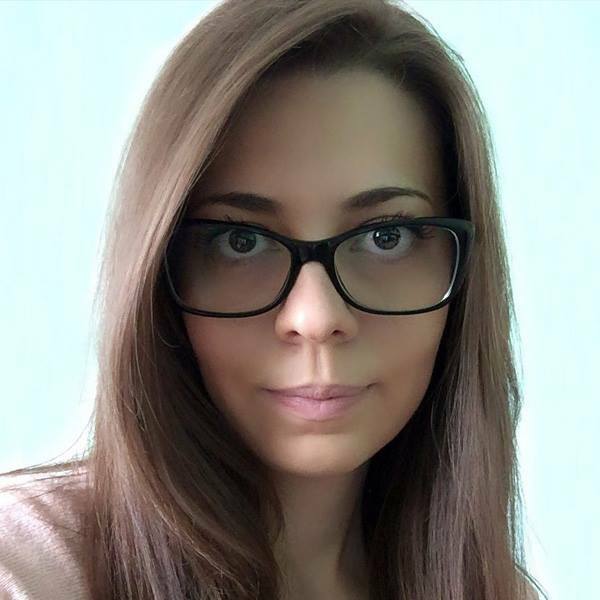 Consider this too – working out from home, with programs such as Beachbody on Demand, you’ll be listening to coaches like Tony Horton and Chalene Johnson yelling in your ear. Along the ocean shore – nothing but the waves, and perhaps some muffled chatter. Sounds refreshing! 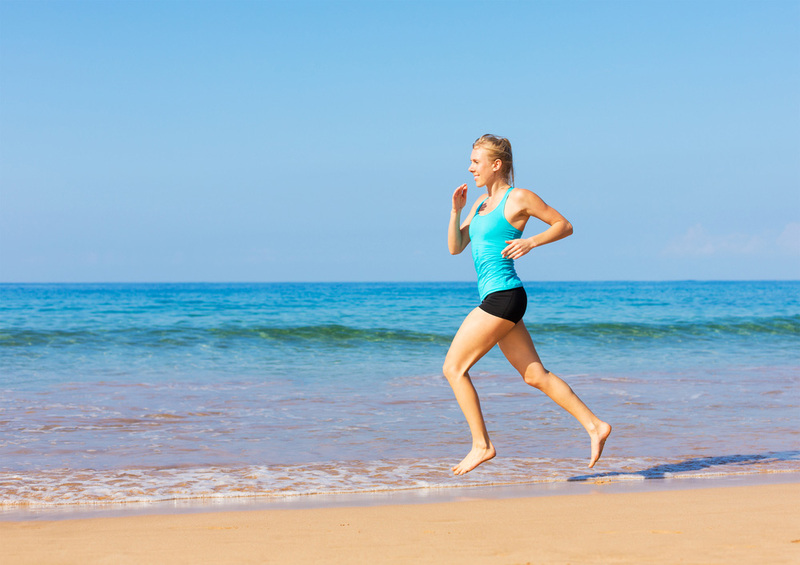 Are sand running shoes a good option for you, or maybe you should run barefoot? According to the experts, either is fine. But keep in mind that if the sand is compact enough, you’ll feel much more comfortable in shoes. So, if you are running on wet sand, and if you have never been running barefoot in your life, shoes are probably the preferable option for you. On the other hand, if the sand is dry, especially if it’s deep and soft, running will be easier if you are barefoot. If you choose to run with shoes, than probably the first question that will pop on your mind will be – how to keep the sand out of the running shoes? The answer is quite simple. Wear socks, and find yourself a model with tight mesh instead of an open mesh. This will help keep the sand out of your shoes when running on softer ground. It’s impossible to completely prevent sand build up in your shoes, but at least you’ll be able to keep most of it out. Footwear, therefore, is the most important gear for running on sand. Nike, Adidas, Puma… it doesn’t matter. Shop for comfort, and shop for a tight mesh. Oh, and the less friction from the sole, the better. If you choose to run barefoot, you have to be very careful. First, always be aware of the ground under your feet. There are a lot of hazards, like shells and other sharp objects that can be hidden in the sand. Second, don’t forget that your feet are used to the support of shoes, so there will be several unwanted side effects in the beginning. You may feel like your legs are getting tired faster, and you may feel pain. This will go away after your feet adapt to the new running conditions. It turns out that athletes can experience a lot of benefits from sand training. It doesn’t matter if you are an amateur or a professional, if you train basketball or football, sand workouts can be much more effective than working out on any other terrain. Several studies can confirm this. For example, a 4-week study done on 40 NHL players showed us that the players training on sand experienced less soreness compared to the players training on grass. They were all doing the same exercises. Another study, done on female sports athletes, that was measuring the effects of pre and post training on sand vs. grass showed that training load, HR and VO2Max did improve significantly for the sand training group when compared against the grass training groups. Some of these can be referred to as sand plyometric workouts, or sand workouts for explosiveness, but even if you do a light jog, you will notice improvements in this vertical. Running in sand for speed is perhaps the best method of training for that particular aspect of fitness. It is equal, if not more demanding than running uphill which is usually a more available option (not if you are living near the ocean!). Does running on sand make you faster? It most definitely does! But regardless of whether you are interested in sand workouts for basketball, or sand workouts for football, or simply running on the beach to lose weight, the benefits of sand training far surpass the discomfort you’ll initially have to endure.